At least eight people, mostly police and soldiers, have been killed by a car bomb in north-west Pakistan. 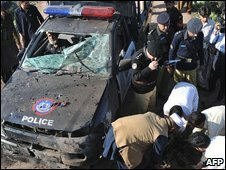 Police said they died after being lured to a booby-trapped car on the outskirts of Peshawar, capital of North-West Frontier Province. At least five people died in two other attacks on Saturday, days after Sri Lanka's cricketers were targeted. On 3 March, gunmen fired on a bus carrying Sri Lanka's cricket team in the eastern city of Lahore. Seven Pakistanis, including six police officers, died in that attack, and several cricketers were injured. There have also been regular battles with rebels elsewhere in the north-west in recent months, particularly in the Swat valley and in the tribal region of Bajaur. Saturday's bombing near Peshawar occurred when police received an anonymous tip-off that there was a body in a car on a highway near the village of Badaber, local police chiefs said. But as police examined the car it exploded. Five of the dead were police officers, two were paramilitary soldiers, and a passer-by was also killed. Five others were injured. "Police went there. They found the white car. They also saw a body inside, but when they were pulling it out, the car bomb went off," an area police chief, Rahim Shah, told the Associated Press news agency. He called it a "new technique". Initial reports had suggested the car exploded after being motioned to stop at a roadblock. They also suggested it was a suicide bombing, though later reports said the bomb was detonated remotely. There has been no claim of responsibility, but officials blamed Taleban militants. The bombing is said to have occurred on a route between the Khyber tribal agency and city of Peshawar. The Khyber agency is a semi-autonomous tribal region of North-West Frontier Province and has long operated largely beyond the reach of Pakistani law. The BBC's Syed Shoaib Hasan in Islamabad says the region, set in mountainous terrain close to the border with Afghanistan, is in the midst of an insurgency by Taleban militants. He says Pakistan's security forces are battling the militants throughout the region to stop the militants from attacking Nato forces in Afghanistan. Security forces also aim to prevent the militants providing safe havens for al-Qaeda in the border regions, he adds. The Khyber Pass route through the region towards the Afghan frontier is a key supply route for international forces in Afghanistan, but has itself become a target for rebels and was closed by Pakistan late in 2008. 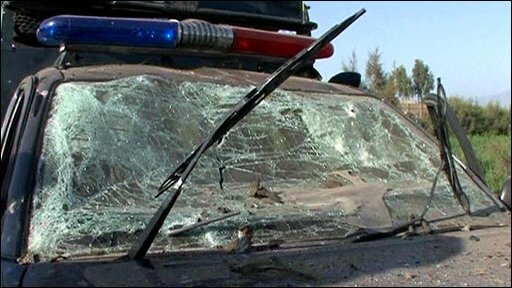 In other attacks in the region on Saturday, at least two people were killed when a vehicle carrying members of the security services hit a landmine in Darra Adam Khel, near Peshawar. And at least three people were killed and 10 injured in an explosion at a mosque used by the militant group Ansar ul Islam in a remote part of the Khyber tribal region.